That's a jet up there, we have no airport but lots of fly-overs, both civilian and military. Makes for an interesting sky. We still have a few leaves hanging on; around here, they may hang on until Spring. Have a photo that's Straight Out Of the Camera that you want to show off? Just sign-in with Mr. Linky, and we'll come visit. Looks like it was a beautiful day!! Looks like you had a beautiful day. We did after the fog cleared. A very nice shot. Such blue sky! That sky is gorgeous! We haven't seen any blue sky here is quite a few days. I love the blue sky!! I decided to celebrate my new Christmas gift camera by posting the very first shot out of it for SOOC. Great Shot! We have lots of fly overs around here also. We live about 40 miles from an Air Force base. So we gets lots of jets, helicopters, and planes. Have a great weekend! I've seen your photos on SSS and when I went to Dianne's I saw that you've started a new photo meme. Very exciting. I may submit something today; not sure if I'll run out of blogging time, but I'll try. Lovely blue sky. We're wondering if we'll see blue ever again; it's been so grey. 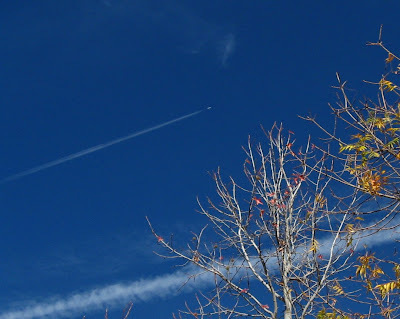 Beautiful blue sky with contrails. I've seen only a few minutes of blue sky here so I very much enjoy visiting yours!